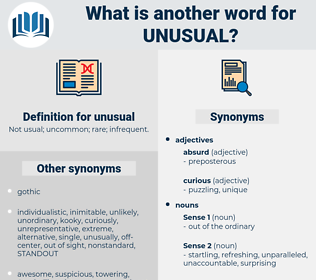 What is another word for unusual? Not usual; uncommon; rare; infrequent. unexpected, remarkable, outstanding, astonishing, irregular, normal, scarce, non-traditional, ordinary, unlikely, rarely, common, unheard, alien, deviant, astounding, startling, regular, wonderful, strange-looking, original, unanticipated, extraneous, customary, puzzling, exotic, awkward, paradoxical, perverse. uncharacteristic, anomalous, abnormal, unconventional, unfamiliar, unnatural, atypical, surprising, unprecedented, infrequent, singular, aberrant, non-standard, uncanny, habitual, distinctive, strange, suspicious, amazing, untypical, tremendous, commonplace, frequent, sparse. 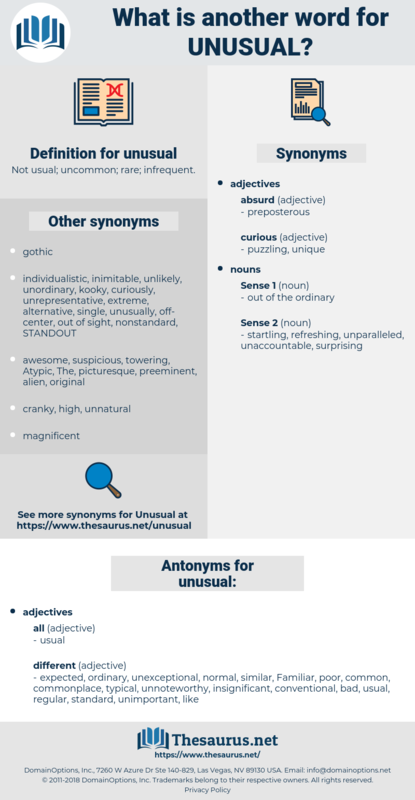 similar, regular, common, unexceptional, standard, unimportant, bad, like, commonplace, poor, normal, expected, Familiar, unnoteworthy, insignificant, typical, conventional, ordinary. natural, habitual, wonted, predictable, plain. David was an unusual man, and his prayers were unusual prayers. She was the one who knew the big, unusual things.